Exit Euthanasia Blog links to other blogs with news that might interest our members, as well as quicklinks to sections of specific interest, statutes and legal provisions. You can find these by scrolling down the right-hand columns. If you are using a mobile device, you may wish to activate ‘Desktop View’ in order to be able to see them. You can support Exit by leaving a donation through our secure PayPal page or by becoming a member (several months wait) by going to euthanasia.cc and printing out an application form, which should be posted with the requisite annual fee. Please read About Exit first. 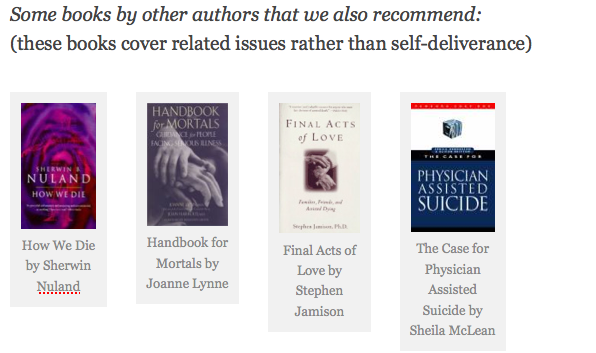 Our print magazine includes the latest information on methods of self-deliverance (rational suicide). If however you are feeling suicidal, and have come to this site because of problems other than unbearable and unrelievable suffering and disease, please consider speaking to someone who has more resources and expertise than ourselves, they are (in the UK) the Samaritans or, in other countries, the Befrienders. You can also buy our books from Amazon if you are seriously and unrelievably ill and can do so without a wait. See the Publications page or click the pictures in the right-hand column. You do not need to be a member. The cost of our books is considerably more than similar books that are available for a fraction of the cost. This is mostly because they are costly to produce. They contain several times more pages than similar works, for instance from America or Australia, but they also differ inasmuch that they are based on very large quantities of data. Such data is costly in terms of time and money to source and analyse (you will find about 1000 citations in the larger volume for instance, which contains more pages than most other ‘guides’ put together). Although we have little control over the costs of production, we are also aware that the cost may discourage certain persons of a more impulsive nature for whom the books are not intended. Our work is born out of compassion, not to encourage suicide. 2. If you have been traumatized by problems such as work, marriage, studies or financial worries, we urge you to find a listening ear, as suicide is NOT the answer to these. In the UK, we recommend you talk to the Samaritans in complete confidence, or in other countries, call the Befrienders. Additionally, some people feel suicidal after a serious medical diagnosis. The shock can be unbalancing and, even if you are told that you are terminally ill (for instance), it is maybe a good idea to wait until you have digested the information, looked at various palliative care options and talked to appropriate support agencies, before considering self-deliverance. Your doctor can treat you for depression, but if you are considering self-deliverance, this is not something that most people would discuss with their doctor unless living in a country (or state) that allows that option. Otherwise the doctor can be placed in a very difficult position and be unable to treat you in the way you wish. Research self-deliverance yourself but ask your doctor to discuss, advise or treat you for things within his professional competence – these include illness, palliative care and depression. When people first approach a euthanasia society, they often have an unrealistic view of choosing the time and manner of one’s own death. They want a quick answer. “Where do I get the pill?” they sometimes say. While some ways are indeed simpler than others, they all require considerable forethought and planning. This in itself allows a certain ‘cooling off period.’ There are two very distinct states of mind we see in people approaching Exit: those that have not formed formed a plan, with all the details, and those that have done so. People working in suicide intervention may often be trained too recognise the two. For different reasons, so do we, and so can you (for yourself or someone near to you). The first state is an emotional one. The person has decided that they’ve had enough. They want to push the button, swallow the pill, flick a switch. They are generally a bit impatient, sometimes even angry, if we point out it is not that simple to do. Before someone in that state can absorb information, they probably need to talk, get things off their chest, calm down a bit (even if they do not appear outwardly agitated). This serves a useful purpose whether the person eventually chooses to end their life or whether they are able find other options. Stop and consider for a moment: 1) They probably don’t want to botch it; 2) They probably don’t want to cause unnecessary anguish to others. Whatever, the objective, taking time to breath deep, get a some good nights’ rest, or whatever you can to find a more level place inside, will have its benefits. The second state is an intellectual one. If a person has made a plan, an idea of exactly how they are going to “do it” then the person has had to think calmly and unemotionally – a useful state of mind even if it does not express your deepest feelings. At that point they might sit down and read some serious literature on the subject. Of course, if it is your firm belief that you have a right-to-die (about 80% of the population believe so) then you may well have done so much earlier on. Things are generally easier to understand when you are well than when you are distressed, feeling under pressure, or very seriously ill.